This is a free filet crochet chart for the fleur-de-lis pattern. It is a graph-based chart that can be used for other types of crochet as well but is intended here for filet crochet in either 3 dc or 4 dc mesh style (instructions for both below). This crochet chart is based on a vintage crochet pattern. 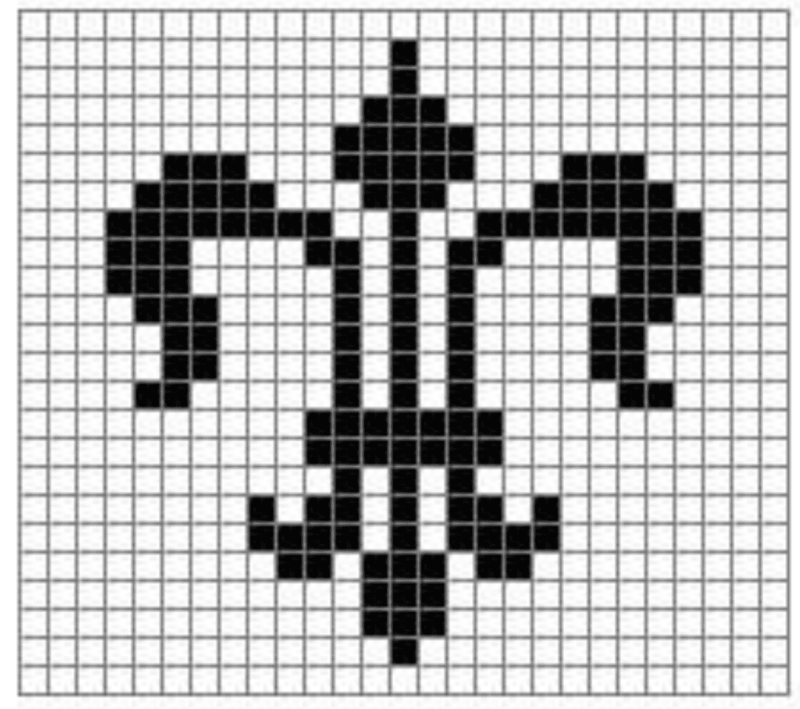 The chart shown here is designed for a filet crochet fleur de lis pattern. However, it can be used for any other technique that uses a graph-based designed. Tapestry crochet, graphghans and pixel crochet are just a few examples of graph-based designs that this pattern is suitable for. This is a square crochet pattern that can be used alone or in combination with other crochet square designs. It can be worked using any yarn / thread and any hook size, depending upon what you are making. If working this as a filet crochet chart, it can be done using the 3 dc or 4 dc method of the technique. For a 4 double crochet mesh: Chain 82, plus 3 (which counts as first double crochet of first row) plus chain 2 (for the chain-2 of first open mesh). To form first open mesh, dc in 9th chain from hook. For a 3 double crochet mesh: Chain 55, plus 3 (which counts as first double crochet of first row) plus chain 1 (for the chain-1 of first open mesh). To form first open mesh, dc in 8th chain from hook. After configuring the starting chain, proceed to read the filet crochet chart as normal. Learn how to filet crochet here. This filet crochet chart was originally printed in Crochet Design, published in 1917 by M. Heminway & Sons Silk Co. The chart was then re-worked by Sandi Marshall to make it easier to read for any of the techniques described herein. The fleur-de-lis has a rich history. It is a version of a fancy lily flower or lotus flower and is associated with the symbolic meanings of both of these floral designs. In terms of history, it represents French Royalty. It also has religious symbolism; considered a design representative of The Virgin Mary but also believed to represent the Holy Trinity because it is a three-petaled floral design. Although the fleur-de-lis does have all of these different meanings, it is also a simple, pretty design that someone might opt to crochet for solely aesthetic reasons.